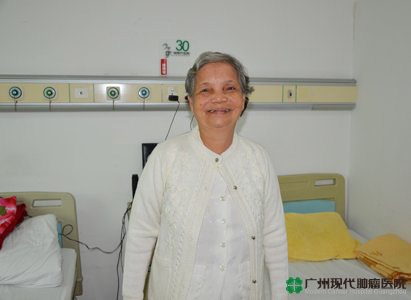 When I walked into the sixth floor of the ward in Modern Cancer Hospital Guangzhou, what I first heard is the laughter from the patients and their families. Their laughter made me feel that I was not in a hospital, but a harmonious neighborhood in high-grade residential building. Sunlight shines into the room from the open doors and windows, which makes the whole building bright and spacious. 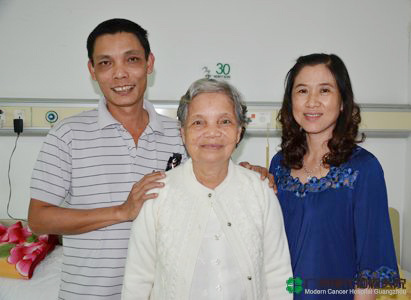 Mrs. Tai Shiran, a 76 year-old lady comes from Ho Chi Minh City, Vietnam, together with her son and daughter-in-law lives in one of the wards. Inside the room, a Buddhist scripture which is always with Mrs. Tai Shiran is placed on the table besides the bed, the toilet requisites are put in the other side. Seeing the decoration of the room, it is more a home than a patient ward to me. I went to a hospital for CT scan in September 2010 because of bad left lower quadrant pain, while the result "ovarian cancer" made me horror-stricken. I was terrified extremely since I don’t know how long I can still live. The doctor advised me to do a surgery, but I rejected. I think this disease is a terminally one that can’t be treated. Everyone is afraid of it. Many patients undergo surgeries but they leave us even faster than those who haven’t undergone any operations. Because I am a Buddhist, I believe that the Buddha will bless me, so I insisted on a period without any treatments. In May, 2011, I felt that my condition become worse: I can’t eat and sleep well and left lower quadrant pain become more and more severe. So I went for a type B ultrasound again, and which turned out to be: left ovarian cancer with peritoneal metastasis, and small peritoneal effusion. I think I can't wait any more. The disease must be treated if I still want to live! Just then, my family read an article in Vietnamese "Youth Daily" which introduced the technologies of Modern Cancer Hospital Guangzhou, China, and I decided to go for a try. But now I know that our decision is such a correct one. From June, 2011 till now, this is my fifth time to visit Modern Cancer Hospital Guangzhou. During these one and a half years, the doctors have implanted 60 particles in my ovary. Also, 6 interventional operations have been conducted. The tumor becomes smaller and smaller every time and the checking results turn out better and better gradually. Every time when the doctors and nurses hug me like family members and told me "your tumor became smaller ", I will be very pleased. They are really happy for the improvement of my condition. Sometimes I would think that’s an unreality miracle, but it is real. I can have my ovarian cancer treated by undergoing seed implantation and interventional therapies. Besides a little bit pain during the seed implantation operation, I can’t feel any pain for the interventional therapies! I feel that I can live as a normal person without any illness now. I often tell the other patients: See! I am a very good example! We need to seek a doctor for treatments when we are sick. We need to build confidence for the treatments. With the development of the advanced technologies, cancer is not an incurable disease, but something like a "chronic disease”. You can also recover well like me as long as persisting on the necessary operation and follow ups. I can still manage my shop after my discharge from the hospital. “Counting money” is my biggest hobby. I am really happy I can do that every day now. Mrs. Tai Shiran’s words made us laughed. 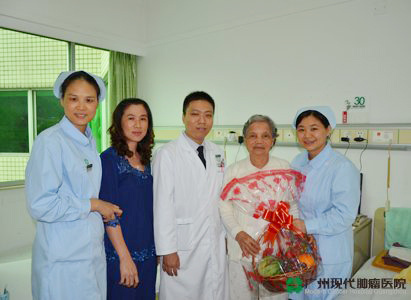 We sincerely hope all cancer patients have an optimistic attitude like Mrs. Tai Shiran and get better soon.